Zie voor een uitgebreidere uitleg ook: Israel boycot en boycott Israel? 1. Boycotts are destructive and divisive. They do not advance peace but only make the parties more inflexible. Efforts to push boycotts divide communities here in the U.S. and result in the vilification of both Israel and the Palestinians. 2. Boycotts undermine hopes for peace. The Israeli-Palestinian conflict is not simple. It is not black and white. Each side must work with the other if there is ever to be peace. Blaming and penalizing only one side rewards the other. Boycotting Israeli products does not encourage Palestinian leaders to return to negotiations. In fact, it shows them that they do not need to negotiate because others are willing to hurt Israel economically and politically. 3. Boycotting Israeli products does nothing to help the Palestinians improve their lives, begin state building, or develop democratic institutions. It is a call for destructive, not constructive, action. If you want to do something constructive to build opportunities for peace, support efforts and programs that bring Israelis and Palestinians together. Believe in the democratic process  buy both Israeli and Palestinian products. Have a Mideast Day, on which each person can vote with his or her purchases. In other words, invest in peaceful coexistence. 4. Arguments supporting boycotts ignore the context of Israel's actions in order to justify penalizing only Israel. Those behind the boycott efforts never mention the ongoing terrorism that Israelis have suffered from, and they never mention groups like Hezbollah and Hamas. They ignore 60 years of terrorist attacks against Israeli civilians and ten years of over 10,000 missiles and mortars fired by Hamas from Gaza into Israeli towns and villages. 5. Punishing Israel is hypocritical. Boycott activists were silent when Palestinians launched the suicide bombing campaign that murdered over 1,000 Israeli civilians while they were in pizza restaurants, on school buses, and at dance clubs. Those promoting boycotts against Israel were silent when Hamas launched 10,000 rockets at Israel's southern communities, murdering toddlers and turning everyday life into a lethal game of Russian roulette. They have been silent about Hamas' and Iran's openly announced genocidal goals to destroy Israel. 6. Supporting boycotts against Israel gives cover to  and in effect supports  the most regressive forces in the region and in the modern world. Boycott activists ally themselves with Hamas and Hezbollah, two of the most repressive, reactionary, fundamentalist religious/political movements. Gays and lesbians are summarily killed. Women have minimal rights and are completely subjugated to the men in their families. There is a complete disconnect between liberal beliefs in human rights, civil rights, women's rights, LGBTQ rights, and democracy and the beliefs promoted by Hamas and Hezbollah. Terwijl de media maar blijven roepen dat Hamas gematigd is geworden, hier nog wat voorbeelden van het tegendeel. Yes, it will be an armed confrontation, as well as all other forms of struggle, including civil Intifdada against the occupation, against the wall, and against the Judaization of Jerusalem. There is no doubt, however, that the armed confrontation will continue to be the main effort and the backbone of the resistance, until the liberation of Palestine. I think that politically, the two-state solution is over. The people who suggested this notion are the ones who say so. Therefore, trying to talk about a two-state solution again is like talking about something that is over and done with. I think that we are entering the phase of the liberation of Palestine. When we talk about the liberation of Palestine, we are talking about the notion of Return: the return of the refugees to their homeland, and the return of the Israelis to the countries from which they came. Voor wie dat nog niet overtuigend vindt, staan hieronder nog meer voorbeelden. Despite Hamas' insistence that it refuses to recognise Israel and is as committed as ever to armed struggle, as clarified by these recent statements, The Guardian offered the group an in-print opinion piece this week, in which Musa Abumarzuq argued that Israel was the 'real spoiler for peace'. Het is geweldig dat de Joodse vluchtelingen nu aarzelend op de agenda lijken te worden gezet, maar in tegenstelling tot de Palestijnse vluchtelingen en al hun nakomelingen zoeken ze geen recht op terugkeer. Noah Pollak, the executive director of the Emergency Committee for Israel, said that the Jewish right of return is actually not an issue that's part of the peace negotiations, largely due to the fact that a) there are no Jewish refugees, and b) they don't have any desire to claim lands in Arab states. "I would like to congratulate the administration for even-handedness, but in fact there are no Jewish refugees today. That's because the Jews who were expelled from Arab countries have been citizens of Israel for decades, where they live in freedom and prosperity," he said. Precies. Israel en in mindere mate de VS en Frankrijk hebben de Joodse vluchtelingen die na Israels stichting werden verdreven of wegvluchtten uit de Arabische landen, opgevangen, voor fatsoenlijke behuizing gezorgd en ze gelijke rechten gegeven. Vluchtelingenkampen werden zo snel mogelijk opgeheven, niet in stand gehouden. Er was ook geen UNRWA die de kampen in stand hield en de integratie van de vluchtelingen in Israel (of de VS) tegenhield. Waarom dan toch de Joodse vluchtelingen erbij halen? Simpel: zij hebben meer bezittingen verloren dan de Palestijnse vluchtelingen die vele miljarden claimen, naast natuurlijk het zogenaamde recht op terugkeer. Het feit dat ze nu geen vluchteling meer zijn komt omdat Israel zich openstelde voor hen en ze gelijke kansen en rechten gaf. Het is niet Israels schuld dat de Arabische staten, maar ook de PLO, dat niet deden met de Palestijnse vluchtelingen en ze integendeel als een wapen tegen Israel gebruiken. Tot nu toe willen de Arabische staten niks weten van de Joodse vluchtelingen, en weigert men enige morele schuld of verantwoordelijkheid op zich te nemen. Ook mogen Joden die uit Arabische landen zijn gevlucht deze landen vaak niet eens bezoeken. In tegenstelling tot de Palestijnse vluchtelingen begonnen de Joden in Egypte, Irak of Libië geen oorlog tegen de machthebbers. Zij leefden (vaak al eeuwenlang) vreedzaam in deze landen en pasten zich aan aan de cultuur. Zij accepteerden de vaak vernederende maatregelen tegen hen zoals extra belastingen of beperkingen in de beroepen die ze mochten uitoefenen. Het wordt tijd dat we in het westen eens gaan zien dat er nog een andere vluchtelingengroep was, en dat morele erkenning en enige compensatie op zijn plaats zijn. White House: Jewish "refugees" right of return should be "on the table"
The right of Jews to return to the Arab and predominantly Muslim countries they fled from or were kicked out of over several decades could be "on the table" as part of the Middle East peace negotiations, according to a senior White House official. Ben Rhodes, the deputy national security advisor for communications and President Barack Obama's chief speechwriter on foreign policy, talked about what's known as the "Jewish right of return" during an off-the-record conference call with Jewish community leaders on May 20, only one day after Obama's major speech on the Middle East. A recording of the call was provided to The Cable. In response to a question asking why there is a great deal of focus on the Palestinian refugee issue but almost no focus on the Jews who departed Arab lands, Rhodes declared that the Israelis and Palestinians should negotiate on the Jewish right of return to Arab and Muslim countries and that the United States could play in role in mediating that issue. "While Palestinian refugees have concerns that are understandable and need to be dealt with in the peace process, there was no reference in the president's speech to the approximately one million Jewish refugees that emerged from the same Middle East conflict. I'm talking about Jews from Arab and Muslim countries who were forced out of their homelands where they had lived for centuries," said B'nai B'rith International Director of Legislative Affairs Eric Fusfield. "The international community has never acknowledged their rights and their grievances," Fusfield continued, "[C]an the U.S., as the peace process move forward, play a role in advancing the rights and concerns of these Jewish refugee groups and help ensure that as refugee issues are dealt with... that the focus will not just be on one refugee group but on all refugee groups emerging from the same conflict?" Rhodes responded: "Certainly the U.S., in our role, is attuned to all the concerns on both sides to include interests among Israel and others in Jewish refugees, so it is something that would come up in the context of negotiations. And certainly, we believe that ultimately the parties themselves should negotiate this. We can introduce ideas, we can introduce parameters for potential negotiation." "We believe those types of issues that you alluded to could certainly be a part of that discussion and put on the table and it's something that we would obviously be involved in." The issue of refugees can be a confusing one. GOP Presidential candidate Herman Cain said on May 21 that the Palestinian refugees' right of return was "something that should be negotiated." Cain later admitted that he didn't fully understand the issue. Israeli Prime Minister Benjamin Netanyahu rejected the argument that Palestinian refugees have the right of return to Israel in his Tuesday speech before a joint meeting of the U.S. Congress. "[T]he Palestinian refugee problem will be resolved outside the borders of Israel," he said. "You know, everybody knows this. It's time to say it. It's important." But neither Obama nor Netanyahu mentioned the Jewish right of return in any of their speeches or remarks over the past few days. Op 26 mei 2011 verscheen in Trouw een artikel over een nieuwe en geweldloze strategie van de Palestijnen, die dat doen vanuit hun hoop op de revoluties in de Arabische wereld. Waar in dit artikel over geschreven wordt is één van mijn ergste doemscenario's, het nieuwe gezicht van de Palestijnse strijd, wat overal op de Westoever te beluisteren valt: geen aanslagen, maar marsen. Geweldloos verzet. Met Gandhi en Mandela als voorbeelden, geven ze het gevecht om een eigen staat een nieuw gezicht. Op het eerste aanvoelen zou je denken dat deze nieuwe strategie humaner van opzet is dan de eerdere tactieken van de Palestijnen. Maar wie dieper ziet, beseft dat wat zich hier afspeelt eerder doortrapt van opzet is dan humaan. Hoe sinister het op zichzelf ook is, tegen gewapende organisaties kan gemakkelijker geweld worden gebruikt dan tegen ongewapende massa's. Maar die kunnen ook heel gevaarlijk zijn! Daar komt nog bij dat de massa's ook niet goed geïnformeerd zijn en worden. Khaled Mesjaal, bijvoorbeeld roept op om geen angst te hebben voor Hamas, wat veranderd zou zijn. Hoe zo veranderd? Het Hamas Handvest streeft immers nog steeds naar de vernietiging van Israël en wil dus geen erkenning van de Joodse staat. En zonder die erkenning kan Israël nu eenmaal niet een duurzame vrede sluiten. Het artikel is enkel vanuit het Palestijnse perspectief geschreven. Dit initiatief wordt veel te positief benaderd. De gevolgen daarvan kunnen voor Israël desastreus gaan uitpakken. Maar daar wordt helemaal aan voorbijgegaan. Dit commentaar is ook in de trouwmonitor geplaatst. De Palestijnen putten hoop uit de revoluties in de Arabische wereld. Met Gandhi en Mandela als voorbeelden, geven ze het gevecht om een eigen staat een nieuw gezicht. Het front is niet alleen op straat, ook in de diplomatie en zelfs op het voetbalveld. Vanaf enige afstand ziet het er uit als een bizar ballet. Mensen bewegen zich groepsgewijs richting een hek, waar ze worden begroet met luide knallen en grijze rookwolken, en dan trekken ze zich nogal chaotisch terug. Als ze elkaar weer gevonden hebben, herhaalt alles zich: de golf richting het hek, de knallen, de rook, de chaos, de hergroepering. 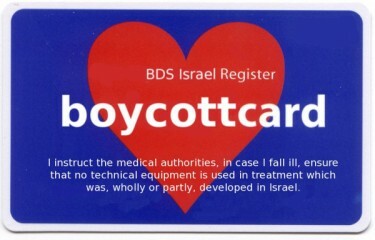 People who want to boycott Israeli goods are invited to print this and carry it with them at all times. Israeli company Given Imagining, developed the PillCam for examining the esophagus and digestive tract. "Palestine is the best-kept secret in the aid industry," I am told by Emily Williams, an American project manager at a medical NGO. "People need field experience and Palestine sounds cool and dangerous because it can be described as a war zone, but in reality it's quite safe and has all the comforts that internationals want. Quality of life here is so much higher than somewhere like Afghanistan, but we don't tell anyone so that we are not replaced or reassigned." That quality of life is becoming rapidly more apparent in the "A" areas. In cities like Ramallah and Nablus, expensive restaurants and high-powered financial institutions are common now. Nightlife and entertainment is expanding to cater for international tastes. Deze mensen zijn meer bezig met het behoud van hun posities dan met het helpen van Palestijnen. En om hun posities te behouden moeten ze een beeld scheppen van een arme wanhopige bevolking die in zeer zware omstandigheden leeft en zonder de aanwezigheid van internationals bij bosjes zou worden afgeslacht door de wrede zionistenhonden. Vandaar al die eenzijdige rapporten waarin zaken op hun best worden aangedikt maar waar soms ook falikante leugens in staan. Hier zouden onderzoeksprogramma's als Zembla of Holland Doc of Francxx (Canvas) eens onderzoek naar moeten doen, in plaats van de Palestijnse propaganda na te papegaaien en met de eeuwige 'vredesactivisten' van Gush Shalom, Breaking the Silence of het Alternative Information Centre te praten. Hier valt nog heel wat te ontdekken. An eye-opening article rom "This Week in Palestine:"
Ala'adin from Al-Bireh used to greet new foreign arrivals to Palestine with a cheerful, "So you're here to save my country too?" He was fond of mocking good intentions. Still it's fair to say that most international visitors to Palestine, particularly those in relief or activism campaigns, do so at least partly out of conscience. In Britain, and I daresay most of Europe, Palestinian liberation is widely seen as a "good" cause. While many Palestinians feel abandoned by the international community, surely Egypt has taught us not to confuse a nation's rulers with its population. In London, where I grew up, this conflict was a "red-line" topic. If you took the wrong position on Palestine-Israel, it was as bad as supporting the death penalty, or liking Margaret Thatcher, and you would be considered the devil incarnate. As I overheard at a Kensington dinner party: "You cannot be a good person if you think the Occupation is okay." ...While the vast majority of ex-pats living here genuinely believe in the cause of liberation, it is far from the only reason for our mass invasion. Since the International Solidarity Movement was established in 2001, over 200 NGOs have sprung up in the West Bank and Gaza. Their presence is proof of how favourable Palestinian conditions have become. At times these tastes sit uneasily with local values. More than once I've heard the fear voiced that our influence will damage the traditions of Palestinian society. Most internationals at least attempt to be culturally sensitive, but our differences can be striking. I can only imagine how West Bankers feel to see us breezing over to Jerusalem or even Tel Aviv, but these trips have an allure to visitors from the West, who can be somewhere more like home just half an hour away. In my experience, these guilty pleasures are also popular among young Palestinians with the necessary ID. It is no coincidence that a rise in the number of international visitors here coincides with economic downturn in the West and a shrinking jobs market. With the proliferation of NGOs, the degrees that were just paper back home entitle us to prominent positions in growth industries. For media professionals, there is a wealth of material to be uncovered here, along with the experience of working on such a major issue. Palestine has been a reliable source of news stories since the conflict began, and it receives forensic, albeit often misguided, analysis across the world. For Western students, Arabic language skills are becoming increasingly desirable and many English universities now arrange placements in exchange for volunteer work. Throw in a warmer climate, Palestine's natural wonders and holy sites, lower crime rates, and a preposterously welcoming host population, and it's little wonder that Bi'lin resembles a model United Nations on a Friday morning. Here we see the truth. Being "pro-Palestinian" (which means, of course, anti-Israel) is trendy and cool. Going there establishes one as a daredevil, willing to risk one's life. Thousands of young, faux-humanitarians go there to find a use for their useless degrees, and get paid by hundreds of NGOs that pop up to accommodate them, who can always be counted upon to raise all the money needed to keep the Palestinian Arab NGO industry going. But these same Israel haters will happily travel to Tel Aviv to enjoy the comforts of home. And the NGOs, flush with cash from Westerners who feel that this is the holiest cause on Earth, dutifully churn out reports about how horrible the conditions are, as they live it up in this "war zone." Those reports, filled with lies and exaggerations, are used to raise more money so that these fake adventurers can continue to live it up. Money that could be used to actually help people in need is instead diverted to help young people live it up and write anti-Israel reports. This article raises the curtain, only a little, on an entire industry dedicated to demonizing Israel. It is an entire financial and social ecosystem where everyone knows they are part of a game but they do not want to let the world in on the truth, because it would risk them losing their comfort, stature and prestige - not to mention their salaries. They raise money by claiming life in the territories is terrible and dangerous while they happily flock to live there because it is so safe and comfortable. It is a scandal - but the only people who can expose it are the ones who are profiting from it, so it remains a dirty little secret. Naar journalistieke maatstaven was Obama's speech zeer evenwichtig betreffende het Israelisch-Palestijnse conflict. De mantra van veel journalisten is immers: zolang ik van links en van rechts kritiek krijg wegens eenzijdigheid, dan zit ik blijkbaar goed in het midden. In de berichtgeving zag ik dat "Israel en Hamas" (links en rechts, of rechts en extreemrechts?) afwijzend reageerden en "de PA en Egypte" (de gematigden?) positief. Dat is wat zwart-wit gesteld, want de Israelische minister van defensie Ehud Barak vond de toespraak van Barack Obama "nog niet zo slecht" en ook uit de PA en haar spreekbuis Ma'an kwamen negatieve reacties, zie hieronder. Van mij persoonlijk had de toespraak nog wat scherper en explicieter mogen zijn, maar dan wel naar beide partijen. I have taken a little (offline) flack in my instanalysis of Obama's speech as being something that Arabs wouldn't like, because the meme that quickly bubbled up in right-wing circles (and among some Israelis) that Obama was throwing Israel under the bus. Memetics is often the enemy of truth. It is possible that I downplayed the importance of his "1967 lines" reference, especially since the White House had denied earlier that the president would mention it. In retrospect, I am almost happy that Obama did say it because otherwise we might not have witnessed Bibi's opportunity to clearly and articulately lay out Israel's red lines - something that was badly needed. When I analyze a piece of text, I try not to start off with bias about the source, although I will be skeptical about whether the author is being consistent. I am afraid that too many people - the same people who bitterly complained about "Bush Derangement Syndrome" - have adopted the same formula for Obama, and will reflexively attack whatever he says, even if the first part of his speech sounded a lot like what Bush would have said. There was a lot to Obama's speech. Only a part of it was about the Israeli/Arab conflict. Much - not all, but much - of it was decidedly pro-Israel. This is not to say definitively that the White House has changed positions or has started to see the light. But on its own merits, there was a lot to like, and it is a shame that this is being downplayed in the glare of the "1967" issue. In his Middle East speech, Obama adopted the Israeli story and their demands; he spoke as if he were the Israeli prime minister. In fact, Obama called for a Jewish state, a land swap without defining the size of this land, gradual and phrased withdrawal from occupied territories, a Palestinian demilitarized state, and strong and strict security arrangements for the sake of Israel, postponing the core issues such as Jerusalem and the refugees. The speech included what Israel always asked Palestinians for, security arrangements, which in fact was the main issue for Israel during 20 years of negotiations. Most importantly, with severe contempt, Obama threatened Palestinians. He warned them of attempting to attain recognition at the UN, he said he would not allow them to isolate Israel; he looked at this step as an attempt to delegitimize Israel. This won't create an independent state, Obama said. According to Israelis, the above points were on the agenda of Netanyahu. "What more could he want," an Israeli source stated. Obama rejected the Palestinian reconciliation agreement as well as the Palestinians' recognition campaign. Obama promised he wouldn't impose a deal on Israel, he demanded both sides return to negotiations. He did not condemn the settlement building in the occupied territories, he didn't consider them as illegitimate or obstructing the peace process as he did before, and of course he didn't call for a settlement freeze. On the contrary, he was trying to justify the settlements by saying they continue because negotiations stopped. It doesn't look like there is too much love for Obama's speech on the other side. And this story is not being reported much. Nabil Shaath, a leader of Mr. Abbas's party and a veteran negotiator, said that Mr. Obama's speech had "contained little hope for the Palestinians," except for the one sentence that spoke of the borders of a future Palestinian state being based on the 1967 lines with mutually agreed land swaps, a shift in American diplomatic language that addressed a long-held Palestinian demand. Zahar: Hamas neemt echt geen genoegen met "grenzen van 1967"
Speaking to Al-Emirate Al-Youm, Zahar asked "Why won't we talk about the 1948 borders? Why won't we discuss the partition plan which was internationally recognized?" According to Zahar, Obama "wants to keep us on 22% of the area of Palestine, and talks about the possibility of swapping land, including Jerusalem...and he wants us to give Jerusalem to the occupation in return for 5% of historic Palestine, which is originally our land. This is a great trick." Beste Zahar, het is nu 2011. De tijd dat het VN delingsplan een optie was, is meer dan 60 jaar voorbij. Dit plan is toen unaniem door de Palestijnen en de Arabische staten afgewezen. Jullie wilden het hele land hebben, van de rivier tot de zee en van de Libanese grens tot Eilat. Geen deling, geen vrede, geen compromis en geen onderhandelingen. Dit is overigens nog steeds de positie van Hamas, zoals je ook wel weet en waar je ons geregeld aan herinnert. Ook Fatah beschouwt het hele land overigens als Palestijns, zoals blijkt uit vele TV uitzendingen, clips, songs en uitspraken van Fatah leden. Het delingsplan, even voor de duidelijkheid, is alleen werkbaar tussen goede buren, omdat de grenzen absoluut onverdedigbaar zijn. Het voorziet in zes gebieden, drie voor elke partij (naast Jaffa nog als enclave), die slechts door smalle corridors met elkaar zijn verbonden. Jeruzalem zou onder internationaal toezicht komen maar werd omsingeld door Arabisch gebied. Het is in de eerste helft van 1948 door de Palestijnen (dus voor de Arabische inval op 15 mei) geblokkeerd en zowat uitgehongerd. De Joden wisten zich uiteindelijk een weg naar Jeruzalem te vechten, zodat de weg naar Tel Aviv en andere plaatsen niet langer afgesloten kon worden. Dat men dit, en steden als Beersheva, Jaffa en Ashdod alsnog zou opgeven is natuurlijk volkomen absurd. Ik twijfel er echter niet aan dat mensen als Anja Meulenbelt, Dries van Agt en Thomas von der Dunk dit een zeer redelijk voorstel vinden van een zeer redelijke organisatie. Dat Zahars doel geen vrede maar vernietiging is, ziet men maar al te graag over het hoofd. The Jews will soon be expelled from Palestine that same way they were kicked out by France, Britain, Belgium, Russia and Germany, Hamas leader Mahmoud Zahar said over the weekend. "The only nation that received the Jews after they were expelled was the Islamic nation, which protected them and looked after them," Zahar said in a speech in Khan Yunis in the southern Gaza Strip over the weekend. "But they have no place here amongst us because of their crimes. They will soon be expelled from here and we will pray at the Aqsa Mosque [in Jerusalem]." Zahar claimed that Jews were expelled in the past "because they betrayed, stole and corrupted these countries." Hamas leader says 1967 borders not enough, asks Obama why he wouldn't be willing to discuss 1948 borders. Senior Hamas leader Mahmoud Zahar said Monday that it was clear that US President Barack Obama's platform was not so different from the one adopted by former US president George W. Bush. According to Zahar, the 1967 borders, while "sacred," were not the final borders on which the Palestinians should settle. Obama reiterated his statements from last Thursday at an annual AIPAC meeting in the US that a Palestinian state should be based on the 1967 lines with mutually agreed land swaps, which had sparked outrage from many in the pro-Israel community. Zahar also said it was likely that Obama uses the US veto in the UN "against Muslims" in the issue of the settlement freeze. In February 2011 theObama administration had exercised its first UN Security Council veto when it nixed a resolution calling Israeli settlements "illegal" and demanding they be immediately halted sparkingheavy criticism by many the Arab, Muslim world. The Hamas leader also mentioned that even while Israel and the US have both before called for a settlement freeze, no monitor was ever put in place to make sure this occurred. Zahar also mentioned Palestinian governmental affairs, saying that the reconciliation deal between Hamas and Fatah did not come with an attached timetable. He said that any times, figures, or speculations put forth by the news media is incorrect. The Hamas leader said the government would be formed on "national consensus," and that without consent of all factions, "especially that of Fatah and Hamas, there will not be a government, and as for the characteristics and details of the government a special committee will be established that will choose a president and ministers." Zie ook de video op YouTube. Op 11 mei riep Yunis Al-Astal, parlementslid voor Hamas en geestelijke, op Al Aqsa TV op tot de uitroeïng van de Joden in Israel. Hij zei dat Allah de Joden naar Israel had gebracht zodat de Palestijnen ze uit kunnen roeien, en waarschuwde dat dat binnen enkele jaren ook zou gebeuren. Het 'gematigde' Fatah heeft onlangs een overeenkomst met Hamas gesloten om weer samen te gaan regeren. Velen in de EU vinden dat Israel met zo'n regering zou moeten onderhandelen, en de gehele Westoever moet overdragen. Keer op keer praten Palestijnse officials openlijk en op TV over hun gruwelijke plannen met de joden, maar even zoveel keer worden ze genegeerd door de Westerse politici en media. Yunis al Astal, die namens de terreurorganisatie Hamas zitting heeft in het parlement van de Palestijnse Autoriteit, heeft afgelopen week op TV de Palestijnse genocidale visie op Israël en de joden uiteengezet. Tijdens een uitzending van Al Aqsa TV zei hij dat de verzameling van de joden in het land Israël onderdeel vormt van een plan van Allah dat de Palestijnen en de andere moslims de 'eer' zal geven om de 'kwaadaardige bende' die de joden vormen uit te roeien. Al Astal voorspelde dat 'de Zionisten' over een paar jaar zullen begrijpen dat ze maar om één reden naar Israël zijn gekomen, namelijk om 'afgeslacht' te worden 'in een groot bloedbad'. Met woorden die sterk aan Adolf Hitler deden denken zei hij dat de joden veel gevaarlijker zijn dan alle roofvogels, gevaarlijke reptielen en dodelijke bacteriën bij elkaar, en dat Allah de mensheid door de moslims zal 'bevrijden' van het 'joodse kwaad'. Dan zal er volgens hem een 'Verenigde Staten van de Islam' ontstaan en zal Palestina aan het hoofd staan van het wereldwijde islamitische Kalifaat. Hamas en Fatah / de Palestijnse Autoriteit sloten onlangs in de Egyptische hoofdstad Caïro een samenwerkingspact. Desondanks weigert de Israëlische regering Fatah als vijand te bestempelen, ondanks het feit dat Fatah-partner Hamas wekelijks openlijk oproept dat het belangrijkste doel van de Palestijnen nog altijd de vernietiging van Israël is. Fatah wordt in Jeruzalem nog steeds gezien als 'vredes'partner waarmee Israël mogelijk een akkoord kan sluiten over de oprichting van een Palestijnse staat in Gaza en de Israëlische gebieden Judea en Samaria. Onlangs verscheen er een artikel in Haaretz over het feit dat tienduizenden Palestijnen hun residentiestatus op de Westoever verloren omdat ze te lang in het buitenland waren, en Israel ze dan deze status ontneemt. Het bericht werd onmiddellijk door een aantal Nederlandse media overgenomen. Onderstaand bericht ben ik nog niet tegengekomen. Wanneer Jordanië Palestijnen discrimineert vindt men dat blijkbaar niet zo belangrijk. In what has become almost routine, another group of prominent Jordanians warned against any government plan that would naturalize the Palestinian Arabs into full citizens. Even though most Palestinian Arabs in Jordan are citizens, Jordan has been slowly stripping away their citizenship if they have any tenuous link to the West Bank. “The Department of Civil Status and Passports (DCSP) / Amman Branch has written off my name from Certificate of Citizenship obtained by my father Sulieman Salameh Alfrejat, born in Beer Sheva 1942, on the grounds that I had exceeded the age of eighteen by two months' time (my father got citizenship in the 17th of March 1987),telling me that I should have applied to an independent Certificate of Jordanian Citizenship separately at that time . Here comes the question :whose fault was that? My illiterate father's fault or DCSP's fault?! who is to be blamed?it is clearly that the mistake committed by DCSP and therefore it is their responsibility to correct it. Accordingly, the Department of Civil Status decided to cancel my caller ID and my Family's Book from the register of civil status and asked me to hand them to the Department.Moreover they made a ''security-block'' on my account on Department of Civil Status's computer network , knowing that I was born in Zarqa, Jordan in 1969 and have Jordanian Certificate of Birth a birth and have been living in Jordan on a continuous basis without interruption or travel Since that date until now, and that I am married to a Jordanian lady and I have two sons. Also I do not have any relationship with the West Bank or PA and I have never been there and so I have never had any of its ID's or Cards, you are kindly requested to see the accompanying documents. My grandfather , my father,my mother and all of my 15 brothers and sisters have Jordanian citizenship and live here in the Hashemite Kingdom of Jordan, I also have Jordanian identity number 6285778 and the Jordanian Family Book number 557 233 C which are threatened with cancellation in addition to the Military -Service Book . Because of this step, my family is now 'scattered' between Kingdom of Suadia Arabia where my wife started working there 18 months ago and Jordan where I ,with my 4 and 2 year- old sons respectively , have been waiting for this problem to be resolved but no progress has been achieved so far.. I hope this call find its way to any one with generosity and humanity or to whom it may concern to help me get my documents back soon so that our family could be reunited , knowing that I have handed Ministry of Interior personally,as well as some MPs, a detailed Copy/Letter of my problem attached to it copies of the papers and documents which I have had, but no answer so far - imploring God Almighty to bless and save you He is all –Hearing, All-knowing. For the past 63 years, the majority of Palestinian Arab suffering has been at the hands of Arab countries pretending to love them - not Israel. Abbas presenteert heel Israel als "mijn land"